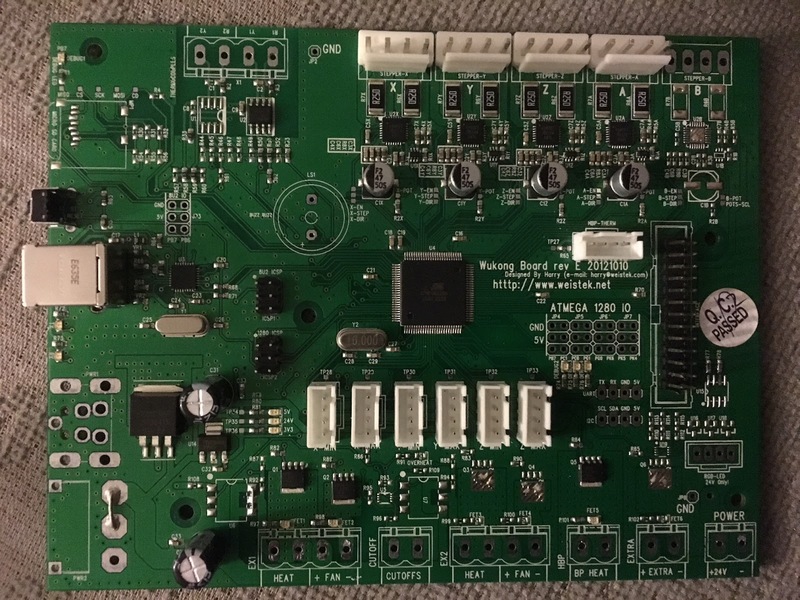 At Interlock, I was handed the old controller board for a gutted 3D printer that was being rebuilt. "Do whatever you want with this." A close inspection of the board showed that it had a main microcontroller of the ATmega 1280, which is the chip used in older Arduino Megas. The interface to USB however was an ATmega 8u2, which is the chip used in newer Arduino Megas, and you may also know it from older Arduino Unos... modern Uno R3s use a 32u4. This board had custom firmware on it so that it didn't look like an Arduino, or any sort of serial connection to the host computer it's plugged into... so as-is, it was useless for general use as an Arduino; taking advantage of the GUI and clicky-clicky programmer interface. So my thought was, it might be nice to have my own 'Mega for testing and such. Could this board be set up in a way that might make this process and outcome easy? Turns out it mostly was. The original board got its power from a power terminls on the board, 24V. It needed to power the stepper motors, and such so it needed to be beefy. This was dropped down to 5 and 3.3 on the board itself. There is a USB B jack for connecting this to a host computer, which did not have its 5V connected, so my thought was, what if i hooked up this 5V to the USB jack. would that be enough to power the chips? 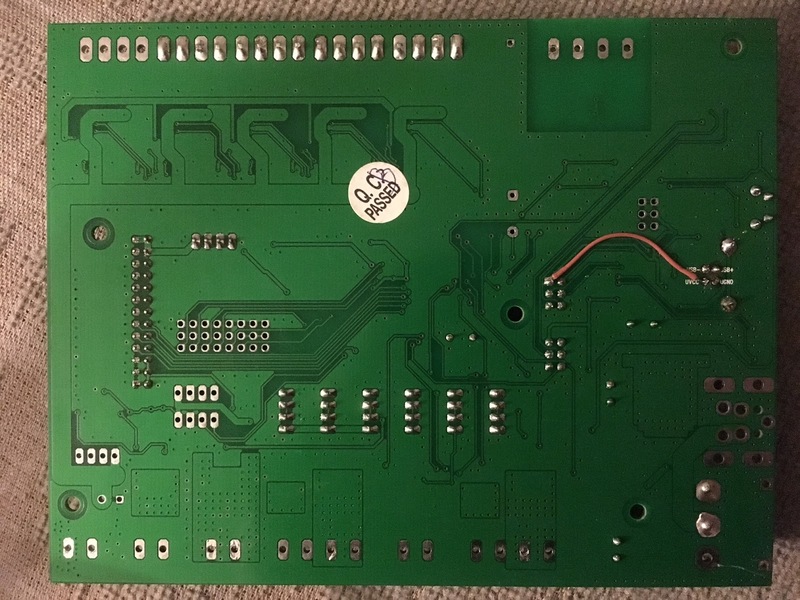 I added this jumper, which connects the +5 on the USB jack to the 5v bus on the board, and plugged it in, and sure enough, it beeped and came to life without its host power supply. Next up would be reprogramming the micros to have the arduino bootloader and code on them. I hooked up my fairly cheesy Arduino D-15 (hacked stepper motor controller) ISP to the 6 pin header, which thankfully was already populated and labelled on the board! I plugged it into the port labelled "1280 ISP", selected the Arduino Mega, with 1280 micro from the Arduino 1.6.6 menus, selected Arduino ISP for the programmer, then selected "load bootlader". In about a minute, it seemed to have completed successfully.... if something didn't jive, it would spew out sync or device errors to the screen. Seemed good so far! Next, was hooking it up to the jack labelled 8u2 ISP. This was a little trickier because I wasn't installing the bootloader (which the Arduino IDE makes REALLY easy to do), but rather the secondary micro's firmware, which basically was just a USB-Serial interface driver. In short, it sets the CPU to at90usb82, uses the stk500v1 communications protocol over the /dev/cu.usbserial driver, at 19200 baud.... it programs the file 8u2.hex, sets fuses and sets other avrdude configuration stuff. After lots of text scrolling by from running that, I was able to drop a program I was working on, onto it via the Arduino IDE directly, without any problems at all! I set the port to the serial Mega, set the board to "Arduino Mega", cpu set at "Mega 1280", clicked 'upload' and bam, fully functional serial communications from the serial montior down through to the '1280 on the board. Whoo! Free Arduino Mega for me! Edit: Here's the pinouts of stuff I beeped out. Nice find though. Im guessing the printer was somewhat newer to contain a 1280. All of the large appliances I had the liberty of probing around inside of (industrial oven, motion sensing door) had unknown DIL micro controllers. Nothing worth salvaging, especially considering the boards were all epoxied to hide "proprietary IP yadda yadda"